Forget a needle in a haystack. For that search you'd be allowed light and air—and when you held the needle in your hand at last, it wouldn't be unrecognizably coated in bone-eating worms. Looking for whale skeletons on the ocean floor is such an impossible task that no one sets out to do it on purpose. The most recent find, lying near Antarctica and crawling with previously unseen species, was a very happy accident. A dead whale that sinks all the way to the ocean floor is called a "whale fall," kind of like "windfall," which it is. The corpse is a massive sack of food dropped from above into a barren landscape. It feeds generation upon generation of life: first the scavengers that pick it clean, then other creatures that chew the bones into scaffolding and bacteria that churn out sulfides, and then a host of animals that feed on these chemicals directly or indirectly. The same types of animals live at hydrothermal vents and cold seeps, where they consume sulfides and other chemicals seeping out of the earth. Whale falls may act as stepping stones for these species to migrate from one undersea chimney to the next. Even though they haven't seen many sunken skeletons up close, scientists have deduced this with the help of experiments such as dropping wood piles into the ocean and leaving them there. When the members of a UK-funded research expedition came across the latest whale fall, they were piloting a remotely operated vehicle (ROV) more than 1,440 meters under the sea. "We were at the end of a very long ROV survey," says graduate student Diva Amon, "and had already gone an hour over our allocated time on the seafloor." Then, she says, "we spotted a row of curious white blocks in the distance." 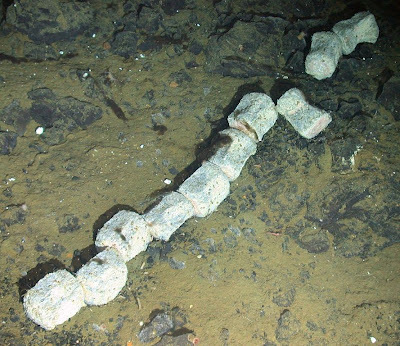 Investigating more closely, the team realized that the blocks were spine bones. They were looking at a whale skeleton covered in deep-sea animals. "We all realized that this was only the sixth natural whale fall to be seen, and the first in the Antarctic," Amon says. "Everyone was thrilled." In this video, you can watch from the eyes of the ROV as it pans across the find. The camera moves from the whale's skull to its vertebrae, which are lined up like a string of enormous marshmallows. Then it zooms in to see the lush jungle of life sprouting from each bone. Around 50 seconds in, you'll get a cephalopod surprise (is there a better kind?). The fronds you see waving from the vertebrae are the tail ends of bone-eating worms called Osedax, which Amon calls "remarkable." Tucked in between them are the shells of limpets. When the camera pans down to a fellow who looks like a rubbery sock (a sipunculan worm), you might spot tiny crustaceans scurrying across the bone in the background. Did you see the worm whisk itself into hiding when the squid jetted by? You should probably watch again to be sure. If the pale denizens of this skeleton look weird to you, they were weird to the scientists back at sea level too. The creatures at the whale fall included nine species that had never been seen before. "Every time one explores the deep sea, there is a very large chance of finding a new species," Amon says. DNA analysis showed that the skeleton, nearly 11 meters long, once belonged to a minke whale. The types of creatures now living on it were similar to those at other whale falls. Based on these life forms and the state of the bones, scientists could tell that the whale fall has become a sulfur-rich environment. It houses the same animals that inhabit deep-sea vents and cold seeps, and it may be helping those creatures migrate across the ocean floor. "One species of limpet that was found on the whale bones was also found on nearby hydrothermal vents," Amon says. The researchers couldn't tell whether the skeleton had been in its resting place for a few years or for several decades. Either way, they left this rare needle right where they found it. Images: Whale vertebrae photo and video (c) UK Natural Environment Research Council ChEsSo Consortium; deep-sea creatures (c) Natural History Museum.